Milan Cathedral (Duomo di Milano), Milano, Italy, a photo by Craig Grobler on Flickr. 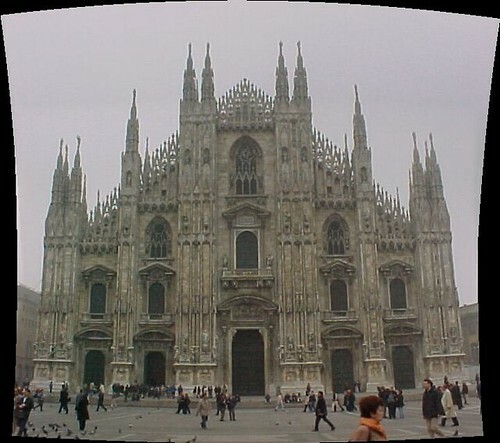 Milan Cathedral (Italian: Duomo di Milano; Milanese: Domm de Milan) is the cathedral church of Milan in Lombardy, northern Italy. It is the seat of the Archbishop of Milan, currently Cardinal Dionigi Tettamanzi. Milan's layout, with streets either radiating from the Duomo or circling it, reveals that the Duomo occupies the most central site in Roman Mediolanum, that of the public basilica facing the forum. Saint Ambrose's 'New Basilica' was built on this site at the beginning of the 5th century, with an adjoining basilica added in 836. When a fire damaged both buildings in 1075, they were rebuilt as the Duomo.